Recently, a new international train launched that serves Urumqi – Almaty – Astana operated from June, 2017 and it runs every day. It is more convenient that it goes via the border with shorter distance and faster train speed. I took this train 3 weeks ago from Urumqi to Astana and now I’m home and wanna share with you the details of the train as well as the price of the train tickets. Notice: the original train that departs from Urumqi South Station to Almaty / Astana is still available. The train terminates at Almaty 2 Station and Astana-Nurly-Zhol Station, not the old Astana 1 station anymore, where it locates near the national museum and the EXPO. The new train terminates at this station as well. The above forum topic is about the details of the train schedule. !!! The train terminates at Astana-Nurly-Zhol, not Astana-1 (the old station), please consider and plan more about the time to transfer if you have continuing journey at the old station. Below I would like to share about the ticket price as well as how the train operates so as to let those who would like to travel by this train to know more before you go. 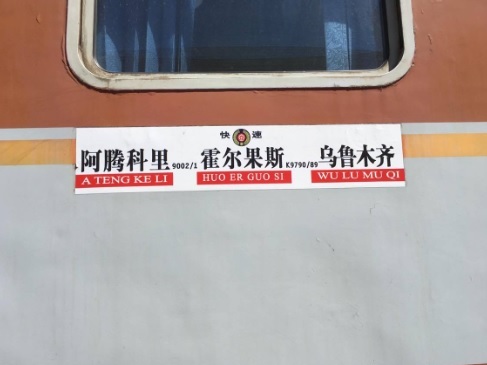 The full series of the train number is K9789 / 9001 / 701 from Urumqi to Astana and vice versa, K9790 / 9002 / 702 as the return train. As you can see it has 3 numbers, which represents three different sections. As you can see from the news of Chinese or Kazakh press they may mention that this train operates by both Chinese and Kazakh Trains. 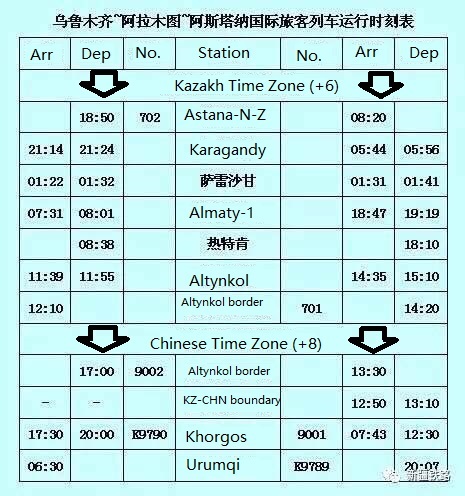 The Chinese Train will serve from Urumqi to Khorgos and then terminates at Altynkol Border(not Altynkol station, it is farther than Altynkol border), the Kazakh train will continue to serve the rest of the journey i.e. from border to Almaty and terminates at Astana-Nurly-Zhol. Like a relay. Wheels need not change for this operation method and thus reduce the travel time. From the image below stated the route of the Chinese Train, it only operates to A TENG KE LI(which means Altynkol). The train uses Talpar-Talgo train which is probably the newest and the fastest train wagon in Kazakhstan BUT for my experience, the train still delayed for 2 HOURS to get to the terminus as the rails are still the old trail planted years ago. Train being late is quite normal in Kazakhstan. The train has air-conditioning and usually 4 beds in one compartment. Different from the ordinary train, the compartment is smaller in space. If you carry big suitcase or bicycle, you may have to put it next to bed but not under the bed. The train has water fountain in each wagon that serves hot water and a bar wagon attached that serves hot food and beer. Price is quite high for the food but cheap for the beer. 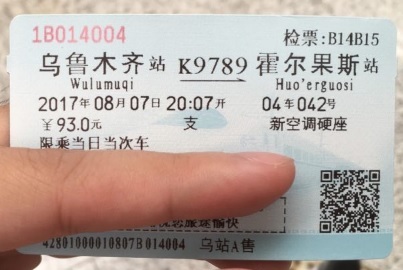 The full price of the ticket from Urumqi to Almaty/Astana is 692CNY and 1040CNY resp. 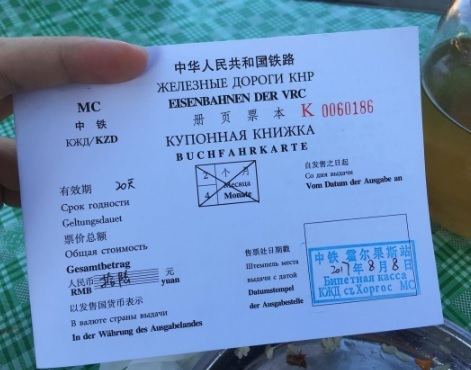 You can also buy the ticket starts from China border station, Khorgos. The price of Khorgos to Almaty/Astana is 182CNY and 530CNY resp. Advance ticket reservation period for the international train is 60 days maximum. Minimum days for advanced booking is 2 days in Urumqi and 3 days in Khorgos. 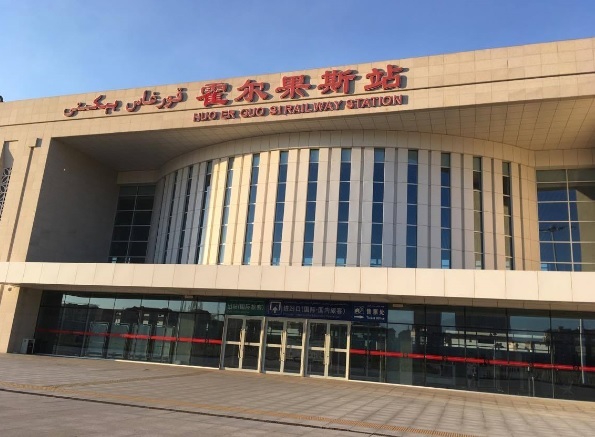 Urumqi Railway Station uses number 12 ticket counter and Khorgos Railway Station uses number 1 ticket counter as designated windows for international train ticket reservation, cancellation and changing. Passengers should submit their passports to go through related procedures. If you are in a hurry or you need to stick to tight schedule, you may use the method that I use. As the international train consist 3 parts as the train number shown. The first section of the train is K9789 which also serves domestic wagon. It travels from Urumqi to Khorgos, the Chinese border station. The domestic part costs 93 CNY for seats and 163+ CNY for hard sleeper. It departs at 2007 at Urumqi Station. Please be aware that Urumqi Station is far from the town, NOT Urumqi South station where it locates at the city centre. You can take train from south station to Urumqi station or 20-min taxi ride from city centre to Urumqi station. The train arrives at Khorgos at 0743. 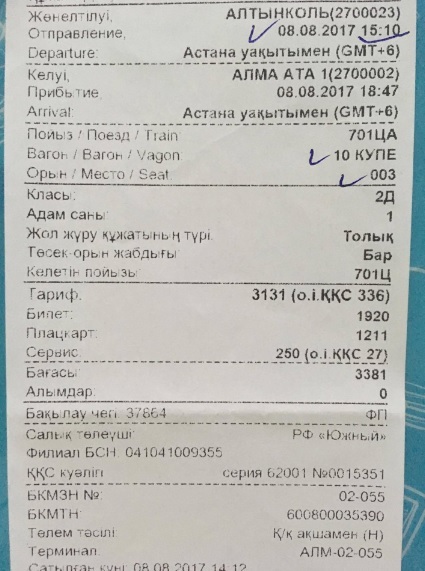 After inquiries from station staff, it is possible to buy train ticket of 9001, Khorgos to Altynkol section, which is the Kazakh border station. The ticket can be bought no later than 90 minutes before the departure. As the domestic wagon sticks with the international train, you must have time to buy the ticket when you arrive at Khorgos. Exit the station and buy the ticket at the ticket office. The price is only 16CNY. It is like a booklet telling you which bed you are in, but anyway the distance from border station to another border station is really short so both sides of staffs may tell you to sit anywhere you want. After the train arrives at Khorgos, the international passengers are told to wait at the station lobby until 11am and you have to come back at that time too. So you are same as them. There's plenty of time that you may take a taxi to downtown and exchange some Kazakh Tenge. The merchants are greedy, I changed at the rate 1 CNY : 41KZT while the official rate is 1:49. You may exchange some that is enough for you to use until you reach the city which has ATMs. The border control and custom check start at around 1130 and it is right next to the station lobby. 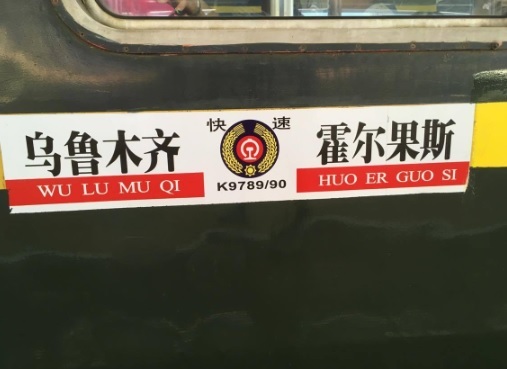 After the border, you will get on the train 9001. It departs at 1230 and will take you to Kazakh border, a small house in the middle of nowhere. Then the Chinese train is done here. You will have to get off the train and go to the house for border control. 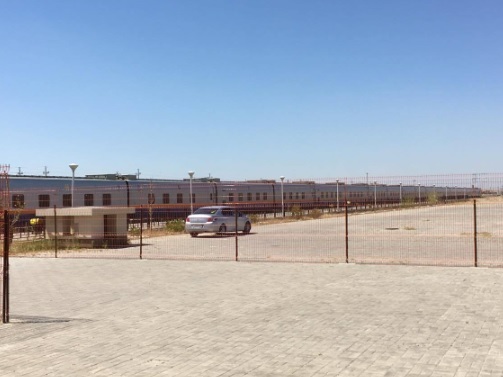 After 1-2 hours of waiting, the Kazakh train will come to the border and hop on it. If your tickets is that 16CNY will only valid to Altynkol station which is 20-minute ride from the border. The rest of the section, train number 701, Altynkol to Almaty/Astana can be bought online from its official company site https://epay.railways.kz/ktz4/proc?pa=c ... pa=clients However, I cannot buy from it successfully with my credit card. If this issue also happens on yours, you may visit the agent site https://tickets.kz/en/gd which has English use interface. It charges 3% of the ticket price as services fee but you may print the ticket or even cancel the booking online. It is really user friendly and I can say it is the cheapest agent compared to others like tutu or even Russian Ticket vending apps. Enter the starting place i.e. Altynkol and the destination station e.g. Alma-ata 1, Astana-Nurly-Zhol, KLaragandy etc. The searching may prompt out error because the station code of Altynkol station from the site is wrong which you can see it from the URL, 2700024. The real code of Altynkol Station should be 2700023. Simply change the code from the URL and refresh it then the result will appear. If you go for Astana, please don’t think of buying the ticket on the day you arrive at Altynkol station. There are huge people from Almaty go for Astana you are probably unable to get a ticket to Astana. Please buy the ticket online earlier before you start the ride. 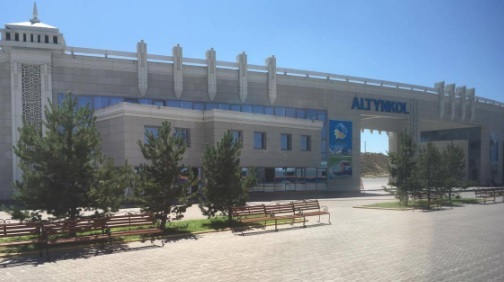 For people who want to go to Almaty, it is fine not to purchase earlier online if you can’t, as there are barely people who will hop on the train from Altynkol, leaving hundreds of vacancies. You may ask train staffs to accompany you buy the ticket from Altynkol station ticket office. They are very happy to help you. They know basic English and if you know Russian then it will be perfect. Ticket to Almaty costs 3400 KZT and Astana costs 12000 KZT. I was separately going to Almaty first and another day the same train to Astana. Below is the e-ticket stating from Altynkol to Almaty 1 and yes, e-tickets usually only give you like a receipt thing but the code on the ticket has already got all the info, the code is like the one printed on the flight boarding pass. Sorry not to show because the upper part contain my personal info. For return journey, I recommend you to buy at least to Khorgos Station from ticket office as I am not sure whether Altynkol station sell for tickets to Khorgos. If not, you may stuck in the station and it is a no-mans-land, it is hard for you to leave the station and go to downtown. The return train schedule can be found in the official site. As I've mentioned the train operates every day so as the return journey. You may search Altynkol to Urumqi (by their name in Russian) then you can find out the train 702Х BUT it cannot be bought on the site or other agents. Please contact and ask station staff for details. !!!! Please notice that this train only goes to URUMQI but not URUMQINAN(Urumqi South), the system has not yet correct it though. Last edited by FansClubMan on Fri Sep 01, 2017 8:00 am, edited 3 times in total. Do you know if it is possible to take bikes on the train? Is this service still running, the main Caravanistan website seems to indicate its not? 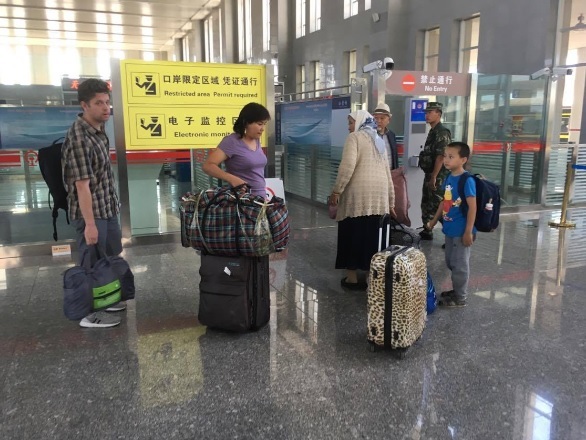 A new, daily train ran in the summer of 2017, connecting Urumqi directly with Astana via Almaty. It has been cancelled. Find out more about this train in the Almaty-Astana-Urumqi train forum topic. 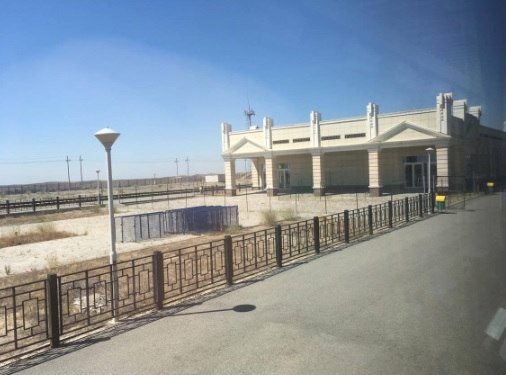 What's not clear to me is whether the additional 9001/2 train (the connection which cost 16CNY in the original report on this thread) still runs the final ~10km across the border into Kazakhstan to connect with train 393 at "Altynkol Border" station. Does anyone have information on whether this connection is still being made? i tink the best solution is taking a direct train from khorgos to almaty since the train 701 is not operating at the moment. and the 393 arrives too late in almaty. Took the train to Urumqi last week with my bike. The one leaving 00.20 Tuesday... so just after midnight Monday. Please read and post reports on the Almaty - Urumqi train below. We summarize all info on the train travel in Kazakhstan page . There is no other train from China to Mongolia than the one going from Beijing to Ulanbataar. Is there any travel-agency in Kazachstan who can arrange train tickets in advance?